Do you need a couch? a shrink to go with it? or would just you like to vent your color? 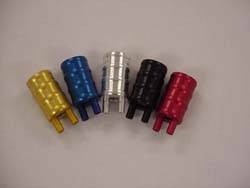 Fast50s Billet Carb Vent - available in Silver, Black, Gold, Red, or Blue!! Hook up your carb tubes and get rid of any air stutters!